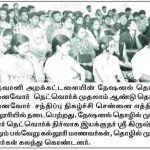 CHENNAI: Aspiring entrepreneurs, entrepreneurship leaders and students from various educational institutions in Chennai came together to share ideas and best practices at the first ‘Youth Entrepreneurship Meet’ on Friday. 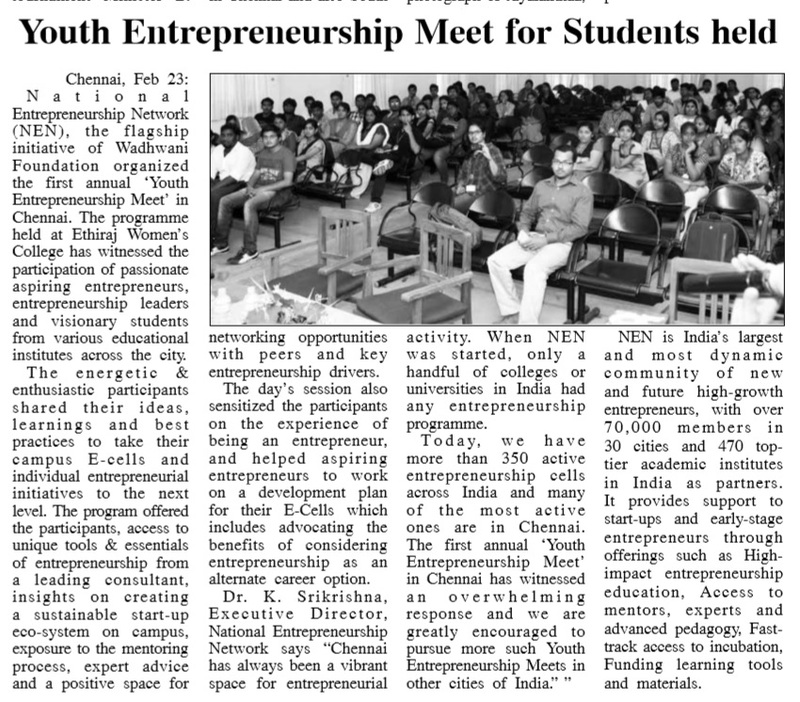 The meet was organized by the National Entrepreneurship Network, a flagship initiative of Wadhwani Foundation, at Ethiraj Women’s College. The programme offered participants access to unique tools and strategies of entrepreneurship from a leading consultant, insights on creating a sustainable start-up eco-system on campus, exposure to the mentoring process, expert advice and a positive space for networking opportunities with peers and key entrepreneurship drivers. The day’s session also sensitized the participants on the experience of being an entrepreneur and helped aspiring entrepreneurs work on a development plan for their e-cells which include advocating the benefits of considering entrepreneurship as an alternate career option. 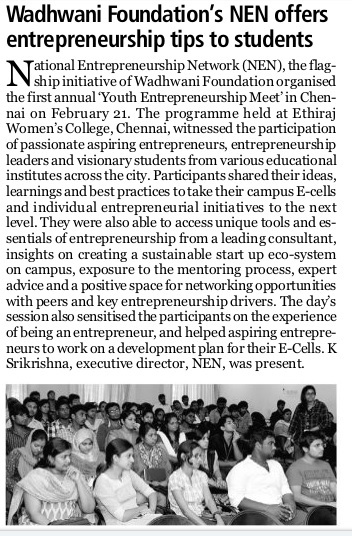 Many colleges have started e-cells to inspire students to create a vibrant entrepreneurial eco-system. It aims at unlocking students’ latent inventive potential to help in the development of India’s entrepreneurial ecosystem by nurturing entrepreneurship through entrepreneurial education and learning. These e-cells connect students to entrepreneurial resources through various events such as seminars, workshops, webinars, start-up showcases, networking opportunities with industry leaders, mentors, peers, prospects, potential employees, vendors and help sustain the entrepreneurial spirit through educational, inspirational videos and mentoring platforms. 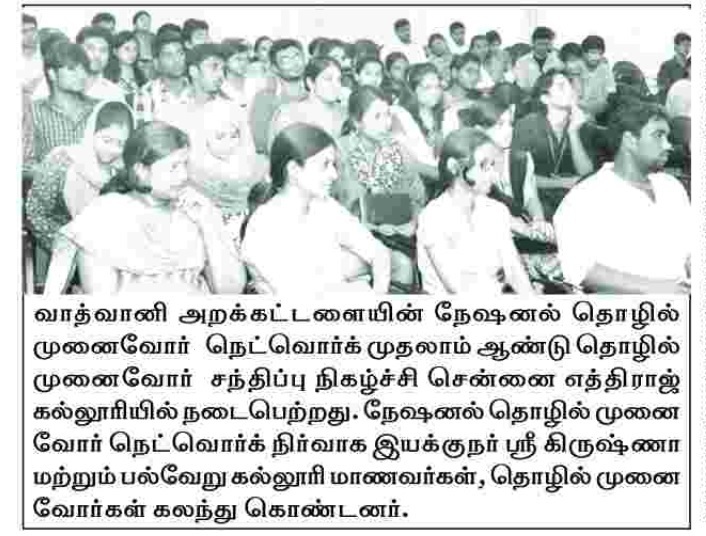 NEN has more than 70,000 members in 30 cities across India, and 470 top-tier academic institutes in India as partners. It provides support to start-ups and early-stage entrepreneurs through offerings such as high-impact entrepreneurship education, access to mentors, experts and advanced pedagogy, fast-track access to incubation, funding learning tools and materials.